DriveTime Isn't the Enemy. Lack of Information Is! Visitor Review: My husband has poor credit. I have poor credit. We needed a reliable car. After doing hours of research on the internet I came across DriveTime. Unfortunately, I read mostly poor reviews about the company. One person complained about the high interest rate. One complained that their car died and they had to pay to fix it. One complained that they were forced into a certain car that they didn't even want etc etc. We went to a few other dealerships, but due to our credit, we could not qualify for a loan. As a last resort we went to DriveTime, not to purchase, but to see what sales approach they'd use. Patrick immediately made us feel welcome. It was close to closing time and in no way, shape or form did he make us feel rushed. He discussed with us exactly what DriveTime did. He took our information and discovered that he could help us. We loved it when he told us to go into the lot and find a few things we liked. We asked him what we were limited to and he said "anything you like". We had a list of demands: The car had to have decent gas mileage, be able to carry my husbands tools in a pinch, have A/C and cruise and NOT be red, black or white. We had many to choose from. 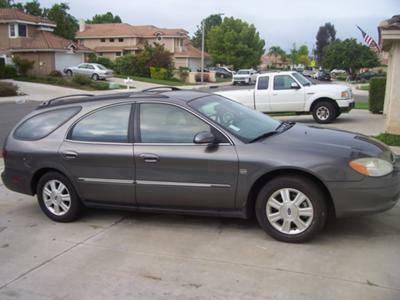 We selected a "03 Ford Taurus SEL wagon. It fit all our criteria. I asked to take it for a test drive. I drove it around a few blocks. We decided to go ahead. We knew we'd have a high interest rate. We figured we'd also have a high monthly payment and need a large down payment. We had to put $700 down and our payments are under $385 a month with an interest rate of 24%. We estimated 29% so they beat our scenario. While doing paperwork I asked Patrick if I could drive the car like an idiot on the freeway to see how it handled at high speed. He grabbed the keys and we went on another drive. The car did great. He told us (and showed us) about the 3 year/36000 mile warranty. We went over a check list and the tire and jack were missing. He went to their storage and got us both. We asked about prepayment penalties and there aren't any. He was honest and told us that the first 2 payments are the most important. He also explained how our payments would be reported to the 3 bureaus. We were encouraged to pay it off early if we could (no other car finance company has ever said that to us.). Overall I found Patrick and DriveTime very honest. He said that if we didn't take care of our end of the maintenance than that might void the warranty. He explained what it did and did not cover. He told us we could actually bring it back for up to 3 days. I think the reason people give DriveTime bad reviews is because they don't read the fine print and they don't ask questions. I asked a lot of questions that were all answered to my satisfaction. I know that if I don't pay the car will be repossessed. I know that if I don't change the oil and keep the fluid levels topped off it can void the warranty. I know that because of my poor credit score I am paying about 2 x what I would on the car at another dealership. I educated myself, so if I get into any mess, it's my own fault, not DriveTime's. I would recommend the one I went to in Riverside California to anyone.